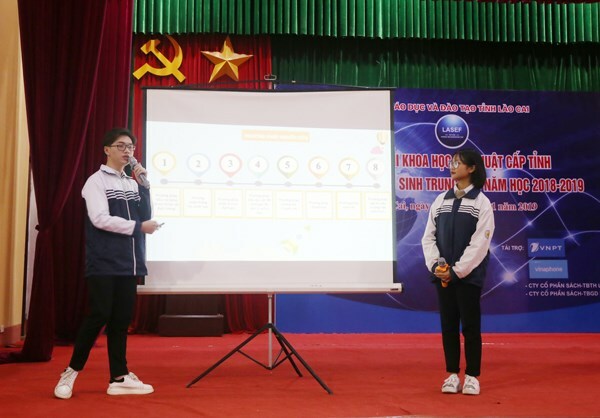 Lao Cai (VNA) – Four projects of students in the northern mountainous province of Lao Cai, which had won prizes in the Vietnam Science and Engineering Fair (ViSEF) in 2019, have been selected to join the Intel International Science and Engineering Fair (Intel ISEF) in the US in May this year. According to Director of the provincial Department of Education and Training Nguyen Anh Ninh, science research in high schools is an important activity to implement innovative teaching methods and forms of assessment. ViSEF provides students with opportunities to comprehensively develop their abilities – especially in independent learning, communication and cooperation, and problem solving and creativity – and develop their scientific research methods, he noted. It is also a useful playground for students to demonstrate their passion, Ninh added. In recent years, provincial authorities have paid attention to methodical fostering and cultivating excellent and gifted students at all grades. This is considered a vital measure to improve the quality of personnel and education standards. In the last four years, the number of pupils winning prizes in national excellent student exams has increased compared to the previous years. In 2019, Lao Cai students won 44 national prizes, ranking 18th among 63 provinces and cities nationwide.